China-based AVIC Legend unveiled its latest project, the centrally-located luxury community in Jinjiang, a county-level administrative district of Quanzhou, Fujian Province, in March 2016. The 800,000 square-meter urban life complex, to be named AVIC Up Town, stands at the intersection of Meiling and Shuanglong Roads. 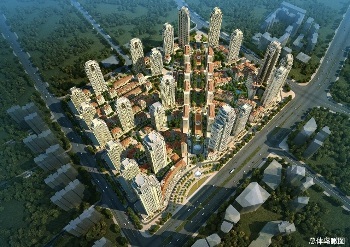 Covering 235,600 square meters, AVIC Up Town will be a mix-used development comprising of 4,030 housing units. It will bring in a great number of high-end boutique shops to cater to the needs of future residents, such as castle hotel and internationally famous brands as well as healthcare, nursery and charity outlets. Architect Robert A. M. Stern, who worked for former U.S. President George W. Bush, will be the designer for the project. The community has a superb location and a unique landscape with comprehensive amenities and a range of high-end homes, including several Western-style dwellings, high-rise apartments, spacious apartments and villas. The space of the residences range from 140m2 to 350m2. AVIC Up Town is the largest and most integrated real estate project designed by Robert Stern in China, representing a city-level real estate masterpiece. Robert Stern was the chief designer for the George W. Bush Presidential Center, while 15 Central Park West, the iconic representation of a contemporary luxury home in New York City, is Stern's masterpiece. World-famous movies stars, industry heavyweights and Wall Street elites have been competing for a spot at 15 Central Park West since space in the luxury building became available in 2008. Many owners of residences in the building are in finance, including Marathon Asset Management CEO, founder and chairman Bruce Richards, hedge fund Glenview Capital Management partner Derek Cribbs, private equity firm CCMP Capital Advisors chairman Jeffrey C. Walker as well as prime office real estate developer SOHO China chairman Pan Shiyi and his wife Zhang Xin. Soon afterwards, 220 Central Park South and 520 Park Avenue, both designed by Stern, entered the roster of New York's luxury residences, assuring Stern's place as the architect to call when designing a luxury building. In collaboration with AVIC Legend since 2013, Stern has designed massive-scale mixed-use complexes in two of China's largest cities: Dalian AVIC International Square and Chongqing AVIC Town. The Dalian AVIC International Square, completed in 2013, is located in the heart of Dalian and has become an urban complex where the city's financial and administrative staff both live and work. With this new project, Mr. Stern and AVIC will be joining hands to transform life in Jinjiang and provide the city and its residents with a world-class urban landmark. Jinjiang may not yet be as well-known as some of its local brands, among them K-BOXING, Septwolves, Joeone and 360°. Jinjiang, located within the hub of South Fujian Golden Delta, is home to many China's household brands as well as to 10,000 individuals with assets exceeding 10 million yuan and 700 individuals with more than 100 million yuan. SM Group, owned by Jinjiang native Henry Sy, Sr. and his family, the most prosperous family in Fujian province, boasts 60 billion yuan in assets. Fujian businessmen have long been among China's most open-minded, proactive and pioneering and have long held an international perspective, however Jinjiang was slow to engage in urbanization, and, as a result, the living standard lagged behind, despite the relative wealth of the city's population. AVIC, a state-owned enterprise, purchased the three centrally-located lots of land that will serve as the foundation of the community for 3.7 billion yuan at land auctions and has already brought in 200 million yuan in revenue during the first round of the selling of residences and office space. AVIC Up Town is now going through the process where the community is being gradually made available for viewing by the general public. The carefully managed process assures maximizing the value for the future owners of the property as well as for the state-owned enterprise. The five-year development plan to complete AVIC Up Town foresees a community with an asset value of 15 billion yuan at the end of the process. The city of Jinjiang is going through rapid development, and AVIC would like to not only be a part of that process, but also be a contributor to the ever improving wellbeing of the city and its residents.